One of the more powerful features of Subtext is the ability to breakdown Storybeats into smaller units of dramatic conflict. The term "Breakdown" comes from our days in animation. Supervising animators would first draw "key poses"--those poses key to communicating a certain bit of acting--and then hand off the scene to an assistant animator to "breakdown" the poses. These in-between poses would help bring the scene to life by giving the key poses fluidity and flow. Same thing with the Breakdown Beats in Subtext. Think of Breakdown Beats as the story within the Storybeat. If a particular Beat tells you that your characters are learning something, then how they go about learning is covered step-by-step by the Breakdown Beats. It's up to you, the writer, to determine how much you want to go into detail for your story. When you first Add a Narrative to a story, Subtext figures out the essential--or key--Storybeats for your narrative. These initial Beats are essential for communicating the essence of your Narrative Argument. Leave one or two out, and you risk losing your Audience. Repeat the same item over and over again, and you risk beating your Audience over the head with your message. It's a tender balancing act, and one that you'll come to know intuitively the more you work with Subtext. If you're writing a screenplay, you likely won't need to Breakdown Beats for the Influence Character or Relationship Story Throughlines. In fact, we strongly suggest you don't. On the other hand, if you're writing a novel, or longform television series, Breaking Down individual Beats will give you the material and inspiration you need to fill in your story's larger storytelling real estate. If you're writing a short story, we absolutely suggest you don't Breakdown any of the Beats. In fact, you're probably best served turning off some of the Throughlines. You can learn more in our section on Short Stories and Subtext. Subtext will let you know whether or not it can Breakdown a Beat by providing a button in the Detail section of each Storybeat. If you don't see the Breakdown Beat button for a Storybeat, it is either too small a Beat to be broken down OR you need to upload a special report from the Dramatica application. See Uploading the Plot Sequence Report for more on the latter. 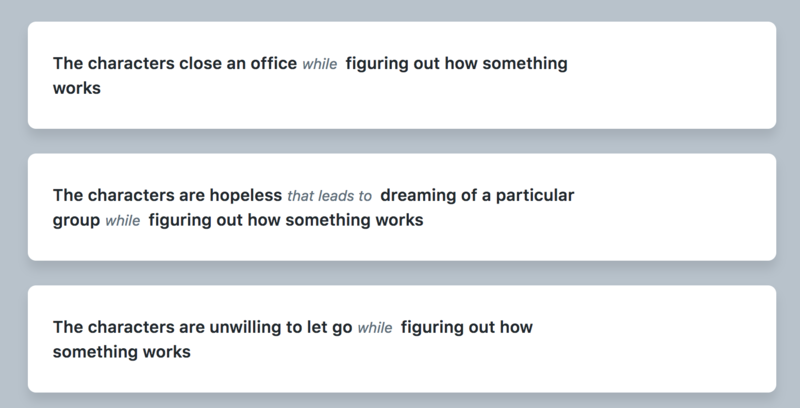 You'll notice that Subtext does more than simply convert, it actually replaced the original Storybeat with these new ones. Fear not, the original Storybeat now works as context for these smaller Beats. You'll see the original "parent" Storybeat listed as context after the words "while". 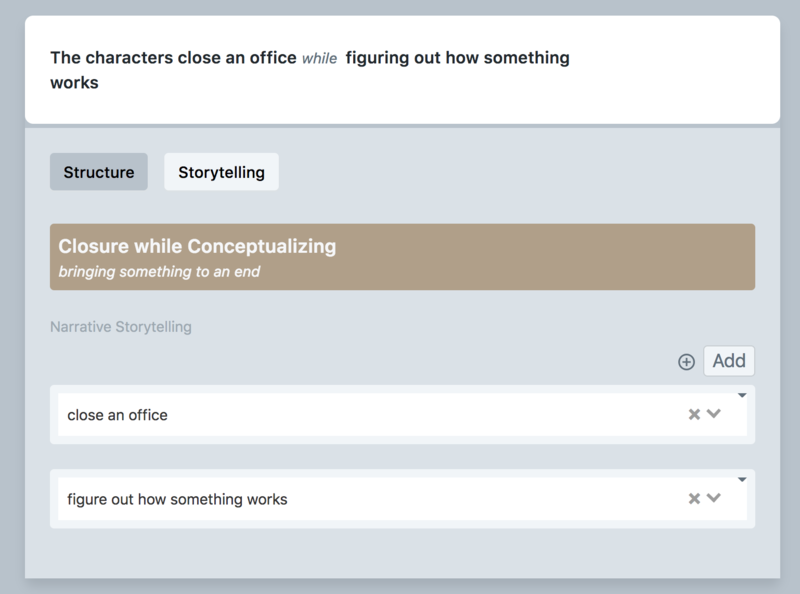 In the example above, it's not enough that the characters first close an office, but that they close an office while figuring out how something works. It's important that you always remember the context for a Broken Down Storybeat. Storybeats always work in concert with the Storybeats around it. By maintaining that frame of reference as you discover and imagine creative ways to write this Storybeat, you ensure that the integrity of your story's Narrative Argument reamains intact. While Subtext retains the frame of reference when Breaking Down a Beat for all the new Storybeats, the writer can shift the context within the Detail of that Storybeat. Simply tap on the Storytelling for the Context of that Beat at the bottom and select a new frame of reference. And don't worry--Subtext will only let you shift the context so far. While you do have a certain amount of freedom in choosing a new context, your end selection will always stay in line with the message of your intended Narrative Argument. In the above example, you can see how the suggested alternate contexts for this Storybeat more or less sound the same. "Figuring out how something works", "figuring out a diabolical plan", "working out something's logistics", and "preparing" essentially communicate the same exact event--it's just the icing on the cake that is different. In this way, Subtext allows for a certain amount of creative license while making sure the writer stays focused and on path with their original intention. Try searching for a new context by typing directly into the dropdown menu. 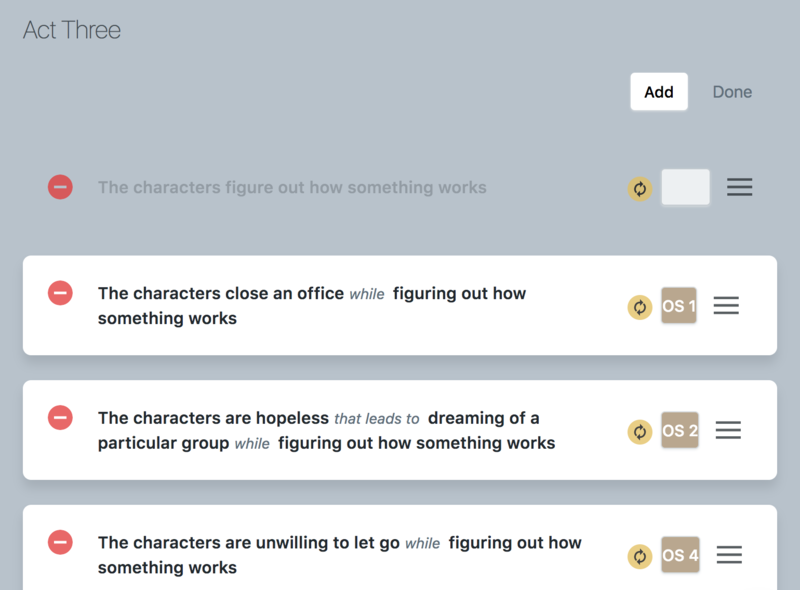 Subtext will autocomplete its Storytelling suggestions based on your entry--providing a quick and easy way to get straight to the core of your story. If you want to bring back the original "parent" Storybeat, you can. There's no rule that says once you Breakdown a Beat, you can't still write about it. In fact, sometimes you'll want to keep that original Storybeat as a means of "setting the stage" for a particular Act in a certain Throughline. When Subtext Brokedown your Original Storybeat, it didn't delete it--it simply hid it from view by marking it "Hidden." Head to the top of the Act in question, and tap the Edit button. When you do, Subtext will show you "all" the available Storybeats for that Act--even the hidden ones. To return the original Storybeat to active duty, simply tap the white Throughline indicator for that beat and Subtext will reinsert the Storybeat into your narrative. When you're finished, tap Done and Subtext will return you to the default Storybeat view. Occasionally, you may find that the Breakdown Beats are too detailed for your story. You may only want one or two of the Breakdown Beats. This is a perfectly legit approach and won't disrupt the integrity of your narrative. Think of your narrative as a range of mountain peaks. Sure, you can zoom in and see the trees and the rocks and maybe a bear or two, but if you leave out a bear or even a couple trees, you'll still see a mountain. Same thing with your story--the initial "big" Storybeats are far more important than the smaller Breakdown Beats when communicating your story's Narrative Argument. You delete a smaller Storybeat the same way you delete the larger ones. Select Edit for the Storybeat's Act and then tap the red "subtract" icon to the left of the Storybeat. If a larger parent Storybeat contains smaller children Storybeats, you must first delete those smaller Beats before removing the larger one. This keeps you from accidentally deleting story material you don't want to remove. Remember, if all you want to do is hide the larger Storybeat, you can do so by tapping the Throughline indicator for that Storybeat.